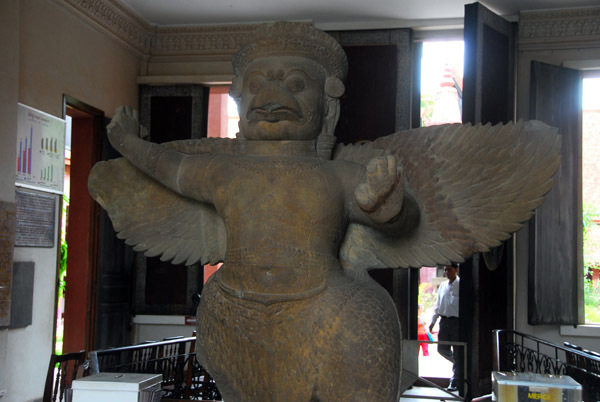 A large statue of Garuda or Eagle, sculpted in sand stone, welcomes visitors in the entry hall of the National museum of Cambodia in Phnom Penh. According to Hindu mythology, Garuda is a personal bearer of Hindu god Vishnu. This particular statue of Garuda was shifted to the museum for safety from its original location in an ancient capital of Cambodia, known as Koh Ker. 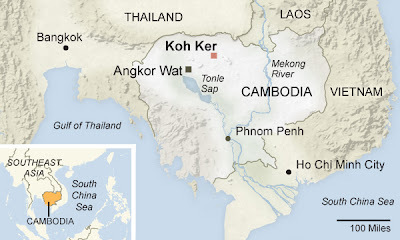 This capital of Cambodia was set up by King Jayvarman IV (928-941 CE) during his reign, 80 miles north of Angkor, and was known as Chok Gargyar (the Island of Glory) or Lingapura then. The old capital was a walled city having an area of about 1.2 square Kilometers and had number of temples including a 30 meter high seven tired pyramid.Koh Ker site is famous for its gigantic figures, human as well as animals and was lost to history for over a thousand years. At the end of 19th century, two French scholars, Louis Delaporte and Étienne Aymonier, rediscovered Koh Ker and its colossal sculptures. In this style of sculptures, the human and animal figures became free standing for the first time in Cambodian history and there were no arches sculptured to support the figures. At Prasat Chen, a sandstone temple at Koh Ker dedicated to the Hindu god Vishnu,, a sculpture commissioned by King Jayvarman IV himself, sometime around 930 CE and consisting of two free standing wrestlers, was discovered by the french scholars. In this sculpture, two figures of wrestlers were more than 5 feet tall and each must have weighed more than 125 Kg. The wrestlers wearing intricate headgear were shown in battle ready stances. It is believed that the two wrestlers are none other than the Hindu mythological figures of Duryodhana and Bhima from the classical Hindu epic Mahabharata, in a battle stance. 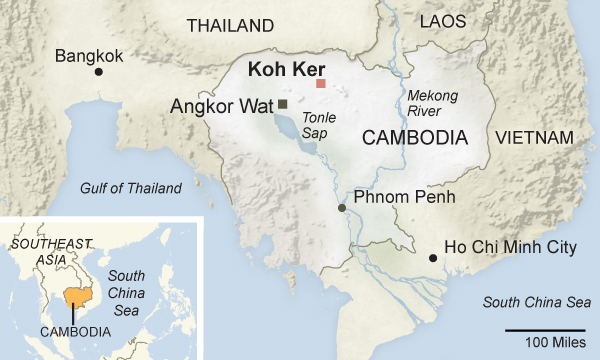 Later, during Khmer Rouge rule of Cambodia (1975-1979), the statues were plundered or looted from the site. Those were the days of complete chaos, power struggle and genocide, when looters hacked the long forgotten and inaccessible temples and pillaged priceless antiquities and sold them to western collectors. 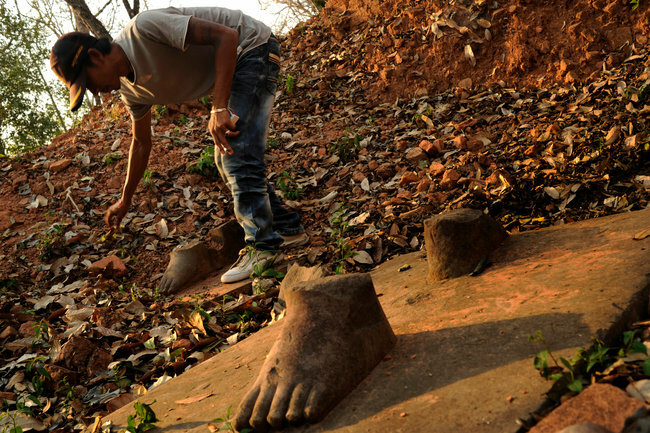 The wrestler's statues were also hacked near the foot and at the ancient site of Koh Ker today, only the feet of the wrestlers, firmly anchored to the ground, remain. One of the statues of wrestlers was traced by Archeologists in 2007 to the Norton Simon Museum in Pasadena, Calif. USA , where it has been on display since 1980. the display board near the exhibit reads the following. Sotheby Indian & Southeast Asian Works of Art sale will be led by a spectacular 10th century Khmer Koh Ker period Athlete from a European private collection (est. $2/3 million). 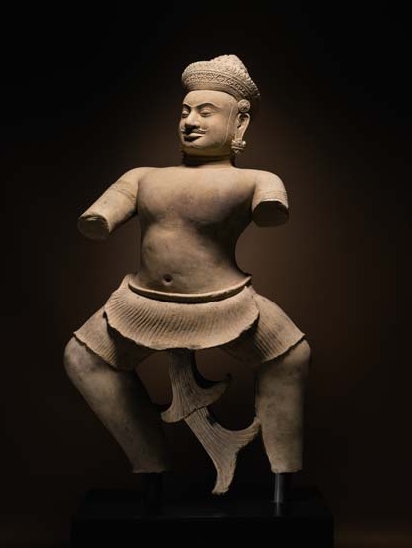 Acquired by the original owner over 40 years ago, the figure is mate to the Koh Ker athlete at the Norton Simon Museum in Pasadena that is almost identical in posture and physical appearance.The Khmer Athlete was commissioned by emperor Jayavarman IV (r. 914 – 928) for his new capital at Koh Ker 80 miles north of Angkor. Koh Ker sculptures are among the great masterpieces of Khmer art. The impressive size and quality of the figure reflects the prestige and importance of the ruler who commissioned it as well of the skill of his craftsmen. The Athlete’s pose derives from Cambodian dance postures which often depicted Hindu epics and mythology. These dances have been a constant feature in the country’s long history. The imposing stance of this figure indicates that it was more significant than a mere temple guardian. Indeed, the Athlete would have been a major mythological figure, instantly recognizable to the Khmer elite of the day and this depiction stands as one of the great achievements of Khmer art. The wrestler's statue was promoted and figured on catalogue's cover and also was included in a news release by 'Sotheby's'. Statue was to have been auctioned on 24th March 2011. 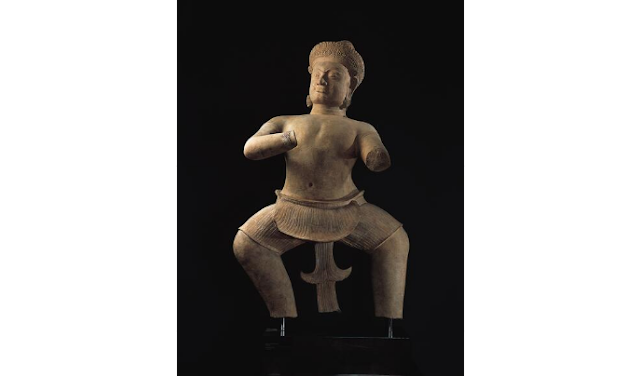 However, on the day it was to be sold, a Cambodian official working with United Nations, Mr. Tan Theany, wrote a letter to Sotheby's and told them that this statue was illegally removed from the site and asked Sotheby’s to facilitate its return. After this, the statue with a catalogue price of 2-3 Million US Dollars was pulled out of the auction. Sothby's say that the seller is a noble European lady, who has acquired the object in 1975 and as per their investigation, there is no proof that it was taken illegally. A quiet tussle has been going on between Cambodian Government and Sotheby's almost for an year for the return of the statue. 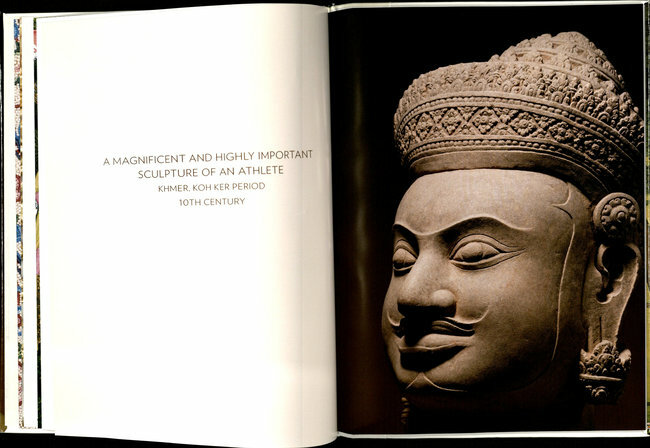 Cambodia have even tried for a private purchase of the statue from Sotheby's. Finally after almost an year, Cambodia has finally made an official complaint to the US Government and have asked their help in recovery of the 1000 year old statue. The department of homeland security has opened an investigation. United state have returned recently treasures to Baghdad museum, ransacked from there in 2003. A Marine Corps Reserve Colnel and a lawyer, Matthew F. Bogdanos, was recently awarded a National Humanities Medal for leading the hunt for these treasures. He says that the times have changed and what was acceptable 50 years ago, is no longer acceptable. Sotheby's do agree now that there are widespread differences in views over ownership of heritage and cultural objects. We can only hope that matter gets resolved soon and the wrestler's statue returns to its homeland, Cambodia.